A dear friend of mine recently shared with me that she’s been setting up a business, specializing in helping women. She’s talked about this for years, but I had no idea she was this close to bringing it to fruition. In the past, when she talked to me about it, she mentioned bringing me in to offer esthetics. Though I loved being an esthetician, I haven’t felt connected to those services in several years. When she showed me her business card and talked to me about the location she had rented, I immediately thought this would be a great opportunity for me to offer in-person Reiki sessions. I’ve had so many inquiries to provide Reiki since being in Phoenix. Some people are interested in trying a distance healing, but most are looking for the hands-on experience of an in-person session. I am so excited to have the opportunity to provide that service! 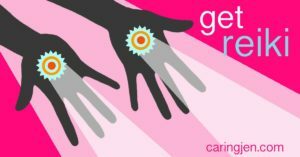 Soon, I will be able to see clients in a central Phoenix location to provide energy healing. Of course, all ventures take some planning and coordination, so I don’t quite have all the details hammered out just yet. But I’m so thrilled and can’t wait to start spreading the word! I hope to be ready to take appointments by February 5th. Please check back and stay tuned – as soon as I have everything ready to go, I will share it with you!